In May, we posted on the art of the Argentinean asado. Today we’ll look at how you can get your steak cooked to your liking. One would think that here in the land of exquisite meat, a simple medium, medium rare, or well done would do the trick. If only that were the case. I find that Argentines typically overcook meat. Most people order their steak a punto (which should mean medium), but it comes out bien cocida (medium well). I like my steak medium rare. Argentine friends have told me to ask for it jugoso (literally meaning juicy which sounds so much better than medium rare). The problem is that there is really no consensus here in Argentina about what the terms mean. When ordering jugoso, I’ve been served anything from rare to well done. A few months back, I went to a little-known restaurant I’d been to before with a group of friends. The first time I ate there (back in October when it first opened), I had an amazing risotto with rabbit and vanilla. Strange combination. That’s why I ordered it and it was delicious. Everyone else I was with also raved about what they ordered. So when I had visitors of the sort that want to experience the food and wine here more than anything else, I thought this place would impress them. Wrong. Three of us ordered medium-rare tenderloins. The waiter and I had this discussion (below), which truthfully should have told me that we shouldn’t order steaks. One steak came out medium rare. The other two were medium well to well. Imagine, one chef prepares three steaks all ordered jugoso in three different levels of doneness. The meat here really is amazing, so if you’re like me, you will want it cooked the way you like. If your Spanish is strong enough, you might want to try describing how you want it prepared instead of using the terms for doneness. Here are some suggestions. We’d like to thank Asado Argentina for giving us permission to use these beautiful photos. Buen Provecho! No offense, but I think that looks gross. For some reason, seeing all the fat and the cartilage makes me not feel carnivorous at all–but then again, soy vegetariano. Anyway, when mad cow disease hits the continent, I hope you’ll all join me for brunch at Bio! Yea, I thought of you and Mandy over there at Still Life when I wrote this one. Not the thing a vegetarian wants to wake up to. Morning coffee, read blogs, big steak front and center. At home I’m a fish and vegetables person whose first appliance was a mega juicer. So, Bio… that’s one of my favorite places in all of BA. It’ll be nice to have people to go with. One more month, right? We’ll be there in a few weeks actually, and yes, we definitely have to go to Bio–all of us. Even my friend the tattoo artist here in Chicago, who doesn’t strike me as the veggie type, was like “you gotta go to Bio man. I went there twice while I was in Buenos Aires.” A propósito, I miss fish so much I could cry (I’m a 1/4 Japanese). Hey Mandy, you have to come try out my juicer. This week has been beets, carrots, fennel, and parsley. I feel so healthy I ate it with chocolate so I wouldn’t totally shock my body. And Jackson the 1/4 Japanese world citizen…we’ll start counting the days with you. Oh and no worries, you won’t be tempted here with fish. It’s sort of hard to come by good fish. But sushi places are everywhere. Hey how much did you pay for your juicer anyway? Just curious. And by the way, if i could somehow make a bumper sticker that said “jackson the 1/4 japanese world citizen” I would surely wear it on my forehead. Let me look around for the receipt or at least check out the current prices next time I’m in the store. I can’t remember how much I paid (but it was worth whatever it ended up costing). It’s really hard to find good juice here. The store-bought versions are pretty awful… taste like chemicals. Plus, they don’t have too many kinds. In cafes though, fresh squeezed juices are readily available. Someone needs to open some juice stands in various places. Ooo.. you’re so right, I left out the chimichurri. And maybe a little grilled provolone. Time for dinner. Thanks for dropping by! First of all, I just want to say that those pictures are making my mouth water! 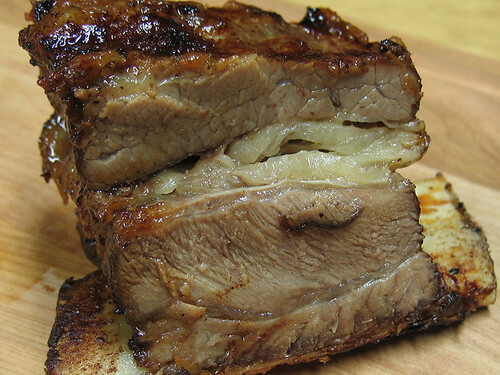 I’d die for some costillas right now (with chimichurri, of course ;)). I completely agree with your comment about Argentines having a tendency to overcook their beef. I personally prefer my meat cooked medium, and I find that request can be very hard to come by! I found the link to your blog through the helpful comments that you made on Jackson’s recent blog posting. I just read several articles on your site, and I’m definitely going to add you to my blogroll! I hope you’ll check out my fledgling blog as well. I’m planning a move to Argentina within the next year or so (although I’ll be outside of Bs As). Hi Katie… glad you found us. It’s funny, the first few comments on this post came from vegetarians and I started to feel bad about the size of those pics of meat. I’ll looking forward to reading your blog. Keep in touch! Hi Tina… me too. I figure everything in moderation. Although, there’s typically nothing moderate about an Argentinean asado. I respect the vegetarians, but give me a big, juicy steak any day. 🙂 Thanks for commenting on my blog and leaving some good suggestions! Where’s bio? I’m Argentine and I’ve never heard of it. I’ve eaten at Granix though, which is a vegetarian restaurant located on Florida Street. And it was nice. Hi Carlos… it’s in Villa Crespo/Palermo Viejo. On Humboldt and Guatamala. Here’s the link in the Oleo Guide http://www.guiaoleo.com.ar/detail.php?ID=539 . Looks like Bio’s actual website is down. Granix. I’d forgotten about that place. You’re right, it is good. Thanks for sharing! Yeah Granix is good, too. Thanks for the info. I can’t wait to go to Bio and try their food. Is it similar to Granix? It’s similar to Granix but better in my opinion because the dishes are really creative (things I couldn’t make myself, which is one of the ways I choose a restaurant). VerdeLlama also serves creative dishes (more upscale though). Let us know what you think when you try it out. In my experience there is only one description that will ensure a really rare steak as the Argentines are always loathe to divorce the meat from the fire – vuelta vuelta, normally does the trick, especially if you can cultivate a vampiric stare that lets your waiter know the price of failure! Ah, yes. Right you are. Vuelta, vuelta will certainly get you some vampiric stares and a rare steak. I love how you put it “Argentines are always loathe to divorce the meat from the fire.” I want to say that it’s changing, but maybe it’s just my circle of friends. Personally, I like my steaks jugoso. Vuelta, vuelta comes a bit too rare for me. Just to add another note here about a restaurant I’ve been to several times and has ALWAYS served a perfectly jugoso ribeye, Cafe San Juan in San Telmo. I should write up a review, but I’m afraid it will become too popular and turn into La Brigada (often cited as the best steak in town, but in my opinion it’s overpriced and no better than any of the others). You are right about the Brigada, but have you tried the restaurant almost directly opposite (I can’t remember its name) with a large plaster cow in its shady courtyard? Here they produce a perfectly cooked steak (I normally eat ojo de bife due to right thickness and fat content to stay rare on the parilla) and you can spend a pleasant afternoon finishing you bottle of wine while laughing at the tourists piling into the B. And don’t forget the best ice cream shop in Baires just up the road. I can’t wait to get back!!! Oh, I’ve passed by there a thousand times but never gone in… it may be the cow that turns me off. I’m going to have to check it out. Another steak place I like in the area is Don Ernesto. 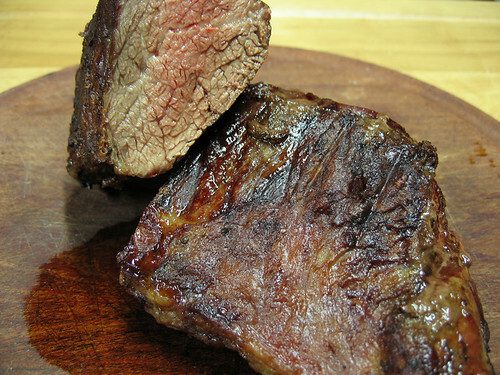 I tend to get ojo de bife for those same reasons, but it took me a year to realize that was the cut I most liked. Thanks so much for commenting. Great advice! I look forward to inviting you guys for a steak when we arrive in October (this time we are staying for 18 months minimum). It would be nice to get to know some people outside of the polo crowd. Emilio… that sounds great! Actually, by Oct I’m hoping we’ll have a grill on our terrace. If you’ll be here for 18 months, we’re going to have to get some nice cuts from the market and cook them just like we like them. Do get in touch when you get here! Plus, now we’ll have someone to explain polo to us. Look forward to a trip to Mataderos with you. We bought a horse from one of the gauchos there a few years ago and had it playing polo the next day. A very brave animal! I will be based in Puerto Madero by the way, so not far away. thanks so much for the post. have been travelling in argentina for two weeks and keep getting disappointed with the steaks i get, because it keeps coming back overcooked. i personally prefer medium rare, erring on the rare side, so will use your tips to make sure i leave this country content with my steak experience, like so many before me. will also try cafe san juan too. thanks for the post! While I hate to admit it, the best steak I had on my last trip was actually at the new(ish) Park Hyatt. While eating on its tranquil terrace may lack the gritty authenticity of the local Parrilla, the quality of the meat more than made up for lack of cultural immersion. Importantly they appeared to have two important ingredients, a frying pan and garlic. 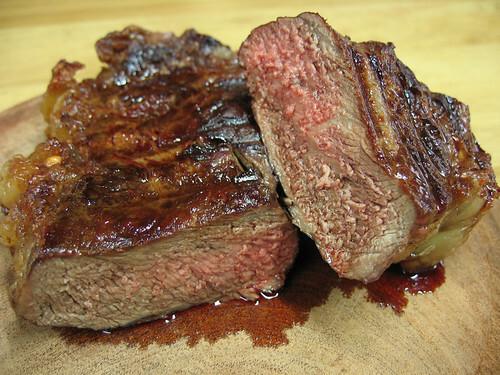 A grill inevitably allows some of the juices to escape the steak, whereas a frying pan at the right temperature combined with a chef that keeps the meat moving should retain all of them. Just ready for a little rest while they redistribute prior to serving. I asked to have the steak rubbed with garlic and under no circumstances for any of the fat to be cut off and ended up with perfection.